Sit down because I am about to tell you about the wildest 3 days of my incredibly short lifespan. Back in April when I received the email from Penn with information about the different pre-orientation programs, I was instantly sold. A chance to get on campus a week before everyone else sounded like a dream. Browsing the list of the different activities, there was one that stuck out to me- PennGreen. Not what you were expecting me to say, huh? I’ve always been interested in sustainability and the preservation of the environment, and a student-run club that puts those policies into practice sounded like perfection. Eager to get in, I promptly began my application, filling out every question effortlessly until I reached the last essay prompt: Write a love letter to your favourite vegetable. Huh? I’ll give them extra points for creativity but at that point, my brain just wasn’t prepared to conjure up a polished exaggeration of my love for spinach. And so, I shelved my application. 2 months later, I was sitting pretty in Geneva, Switzerland when I received an email from Penn. Just as background knowledge, that was when I used to jump with excitement at every email they sent me, after having arrived at campus, I cower in fear from the 25 emails they send me every hour: This is a reminder that you haven’t submitted your assignment that is due…. Back to the issue at hand, I, an excited Penn pre-frosh eagerly opened my email that contained a reminder that the applications for pre-orientation programs were due in a week’s time. At this point, I had completely banished the thoughts of love letters to spinach from my mind. I decided to refresh myself with the different activities and this time, a different program called my name: PennQuest. “PennQuest is an outdoor orientation program…”- the magical words that sold me. I won’t bore you with that application process nor the official description of the program, but I will tell you about PennQuest from my eyes. The night before we departed, there was a pizza night and briefing meeting scheduled to allow us to get to know each other. I remember walking into the Bodek Lounge into an insane party. Nicki Minaj’s ‘Anaconda’ was blasting from the stereo, students were dancing on top of tables and bouncing off the walls tirelessly. The mum in me screamed internally, ‘Be careful! Slow down, you might slip and fall!’. I had no idea what to make of it and was convinced that I had made a mistake by applying to PennQuest. I know now that I shared the same thoughts as the other 133 pre-frosh in the room. We were terrified and had no idea what to expect from the 3 days to come. The wonderful Laurie McCall who coordinates the program conducted a presentation in which she assured us that “what makes PennQuest such a successful and popular program is the leaders who go on the trip with you.”. If she means this bunch of lunatics, I thought, this is bound to be an interesting experience. 134 students were divided into groups of 11 and assigned 2 upperclassmen as leaders. We had Hannah, a sophomore, and Nico, a senior, and as I grew to knew them, they became my new PennParents. Having met my group, we said goodnight and headed to our dorms to pack for a trip that strictly forbade toiletries, electronic devices and watches from the packing list. You heard me, I spent 3 whole days without my phone, without a toilet or shower, in complete ignorance of the time AND even better, I survived it all without the slightest withdrawal symptoms. The next morning we boarded the East-Coast-esque yellow school buses on the way to Camp Towanda. Our camp leaders were eager to capitalise on our nervousness by refusing to divulge any information on the trip. Asking how long the bus ride would be would yield the response, “Oh we’ll be there in about 8 hours”. How far will we have to hike every day? What do we eat on the trail? We learnt pretty quickly that it was better to not ask questions and to just go with the flow. No camping trip is complete without loud, out-of-tune singing on the bus ride and i did not expect any less from PennQuest. WELL YOU CAN’T RIDE ON MY LITTLE RED WAGON, THE FRONT SEAT’S BROKEN AND THE AXLE’S DRAGGIN’, CHUGGA, CHUGGA, CHUGGA, CHUGGA, CHUGGA! SECOND VERSE, SAME AS THE FIRST, A LITTLE BIT LOUDER AND A WHOLE LOT WORSE! Other bus activities include: musical chairs which is played to the death, mooning any other PennQuest bus that passes you- if you’re lucky, you’ll even score an unsuspecting traveller in the lane next to you, and jamming out to white girl classics such as “Mr Brightside”. After spending what I believe to have been 4 hours on the bus, we arrived at Camp Towanda, rushed through lunch before being split into groups (different from our hiking groups) and heading off to complete different activities. Scavenger Hunt: items included finding the most disgusting thing on the camp and having a member of our team lick it (Spoiler alert: it was Michelle’s foot), having 2 members of your team switch clothes (underwear is completely up to you), assigning every leader a celebrity lookalike and finding the funniest bathroom drawing on the campsite (the one below is my personal favourite). Capture The Flag: my team failed miserably at this game. We were all captured within minutes, making our flag easy game for the enemy team. Tackle: this game means exactly what the name implies. My brother plays rugby for the school team so I am a total expert at delivering crippling tackles. Especially when the players are twice as heavy as me. Why haven’t the Blue Bulls signed me yet? Meditation: I am convinced that I fell asleep sometime during that (30 minute???) session but all I know is that I felt so zen at the end. I wasn’t daring enough to attempt the eye contact meditation, which involves as you probably guessed, staring into a stranger’s eyes for some 15 minutes without breaking eye contact. It leaves you vulnerable to the other person and we have a running bet that one of the pairs is definitely going to get married. You read it here first, folks. Astronomy night hike: every camper had to close their eyes and hold the shoulders of the person to the right of them. We walked blindly, only following the person in front of us. This is how I met Robbie, who I still hang out with now, our friendship cemented by the one time I almost suffocated him because I was terrified and held a death grip on his shoulders. That night was made memorable, not only because I had to walk blindly, in the woods, behind Robbie who seemed to be speeding away making it hard for me to keep up, but because when we eventually were told to lie down and open our eyes, I witnessed the most beautiful display of the heavens above. The leaders then read us inspirational poems and proceeded to motivate us by detailing how amazing life at Penn is. I can truthfully say that I have never felt more inspired than in that moment. Lifesaver mints were then passed around, and in the pitch black darkness, we could clearly see the spark produced when our partners bit into them. It only took Robbie 7 tries to get it right. The next morning we set off for the Appalachian trails. I will not lie to you, the first 30 minutes were brutal, soul-crushing, steep uphill climbs. Our group was quick to rename the trip QUADQuest in honour of our beautifully toned quad muscles. We stopped to watch the solar eclipse, which is a once-in-a-38-year-chance, but in Pennsylvania, there was only 80% coverage so we didn’t get a total blackout, but that didn’t make it any less spectacular. I can’t answer your questions of how far we hiked or for how long but I can tell you that it was great to interact with all the different members of the group and get to know them better. We set up camp or the evening and dined on the luxurious selection of white rice, red kidney beans and flour tortillas- so gourmet. The second day was definitely more eventful. We met up with one of the other hiking groups and trekked to a nearby river. The murky waters of the Delaware River were warmly welcomed after 48 hours without a shower. Did I forget to mention that this is also where we retrieved our drinking water for the remaining leg of the trip? Relax, it was purified with iodine which has the most peculiar aftertaste. Top camping tip: make sure to carry lemons in your pack- not only does drinking lemon water make you look boujee, it also eliminates the gross taste of iodine. Highlights include: scaling the top of a lookout tower, spotting a baby blackbear (my first bear! ), pooping in the woods for the first time and avoiding the snakes in the muddy marsh we crossed. The icing on the cake, the crème de la crème and the top experience of that day was the freak thunderstorm that hit that night. After dining on gourmet pasta and tomato sauce, we were sitting around the fire talking about everything and nothing, dreading the end of the trip. The thunderstorm had been playing out in the background but we hadn’t been paying attention to it. Nico gets a message from the upperclassmen back at base camp: Miranda Cosgrove has passed away in a car accident. (Remember that the leaders had to carry their mobile phones in case we ran out of water or someone got injured). Our initial reaction was shock and sadness which eventually dissolved into silence. iCarly was my childhood! It was then that Nico received a second message from base camp: the storm was heading in our direction. Picture this: 13 adults crammed into a tent that sleeps 6 people, savouring the end of what has been a spectacular trip. To add to the ambience, we had lit a candle in what is known as the ‘PennQuest Candlelight Ceremony’. In the background: deafening thunder and torrential rainfall. All of a sudden, we hear the crackle of a tree succumbing to the lightning that struck it. That could only mean one thing: we were dangerously at risk of being struck by lightning. Calmly yet swiftly, Nico and Hannah urged us to get our raincoats out and our shoes on, and to evacuate the tent. Rushing to get out, we were instructed to spread out about 5 feet from the nearest person and get as close to the ground as possible: as lightning only ever strikes the tallest standing object in the vicinity. My initial response was fear, ‘It’s absolutely freezing out here, we saw a bear earlier and who knows what could be lurking in these woods? I’m drenched in rainwater, there is no way that I won’t be sick tomorrow morning.’ It is only through the reassuring voices of my leaders and groupmates that I managed to calm down and view this as an interesting story to tell in the future as opposed to an annoyance. For what I believe to have been 45 minutes, we shouted our most embarrassing stories to each other, combated pesky frogs and insects, and laughed about the past 3 days. When it came time to board the buses the next morning, I was sad to be leaving but content with the people that I had the privilege of spending time with. I can’t think of any better way to have kickstarted my university experience. PennQuest, you truly were the best. Just for the record: Miranda Cosgrove is still alive, that was a ploy by the mischievous PQ leaders. Posted on September 10, 2017 September 9, 2017 Categories Outside the Kitchen, Personal Writing Space, TravelTags Appalachian trail, camp towanda, hiking, ivy league, pennquest, Travel, university of pennsylvania, upenn14 Comments on PennQuest, PennQuest The Best! I apologise to you in advance for what I am going to say next. I acknowledge the sheer controversy surrounding my statements to follow but I have a commitment to tell the truth to my readers. To all my Italian readers and Italophiles out there- I am sorry. After exploring Geneva for a week, the next stop was Italy. We planned to spend 4 days exploring the 2 major tourist destinations, Rome and Venice. The first thing I have to tell you is that the Italian countryside is unattractive. We took the train from Rome to Venice and there was not a single thing to marvel at. Perhaps we travelled at the wrong time of year when the flowers had not yet bloomed or there hadn’t been rain for some time, but it was like a barren wasteland. We spent 9 hours on the train, 2 hours more than had been anticipated, but with a transport strike to follow the next day, I don’t think the Italians were all too bothered about the delay. The landscapes were largely marked by fields of dry yellow grass, rundown gloomy farmhouses and large expanses of empty fields. My advice to you: air travel would be the smartest way to get around Italy. Not only are airlines immune to transport strikes, the views will not disappoint you and you are expected to arrive at your destination on time, even if delayed, the wait time isn’t usually too grievous. Rome is an ancient city. Just how ancient? The city is approximately 2770 years old, having been founded in 753 BC. It has seen numerous bloodbaths: the city has been sacked 6 times by greedy barbarians looking to expand their territories. The Colosseum is a spectacle to behold, although one must not forget the immense suffering that took place within its walls. Slaves were forced to dress as gladiators and compelled to fight to the death; their opponent either another unfortunate soul who found themselves in that precarious situation, or a ferocious (and famished) wild lion looking to appease its ravenous appetite. Even after the fall of Western Roman empire, the Dark Ages and the black death, the city still persisted. Ancient Roman monuments are still standing today and we are able to marvel at the rich history of the city and study the demise of what I think is the world’s greatest empire. We stayed at the Youth Station Hostel, which is a wonderful place to stay if you’re a student on a budget. They provide everything a millennial backpacker needs: a hot shower, clean bed linens and reliable Wi-Fi. If you’re not willing to share a room with 8 strangers, cannot survive without room service and detest bunk beds then I suggest trying the Four Seasons Hotel a few blocks away. We were on a strict budget, and nothing sounds more magical to a student than ‘€11 a night’ (about USD12). This hostel is perfect for anyone who’s on a budget and I would recommend it! The buffet spread at a restaurant down the road from our hostel! It was here that we met Pierre-Louis Tharreau, a Parisain freelance photographer/videographer. Pierre is passionate about travelling and capturing the sights he sees in stunning photos and video clips. He has previously lived in India, teaching English and in the UK, studying photography. You can check out his YouTube channel here. Sa langue principale est le français but don’t despair if you don’t understand French, he does add English subtitles! We only had 1 full day in Rome and we spent it walking around the Colosseum and its surrounding sites. Think Torre Argentina (where Caesar is believed to have been stabbed by his closest friends), Septimius Severus Arch Arco di Settimio Severo (Italians are really good at naming things) and the Altare della Patria. The icing on the cake was watching the sunset at Gianicolo Hill, which is famous for not being of Rome’s Seven Hills, which is pretty elitist in my opinion. You can see the entire city of Rome here, though our view was somewhat obstructed by a couple of overgrown trees. Another thing you need to know about Rome, and Italy in general is that everything is looking to take your money. Some will be very upfront about it, others will be sly and try to pinch your wallet whilst you’re not looking, but you should beware the cunning who construct elaborate plans to extract your hard earned dollars. Dear Gladiator, I am looking at you. Whilst taking photos outside one of Rome’s many basilicas, an enthusiastic Roman gladiator decided to steal the spotlight and pose for a photo with Ruva. Mind you, he hadn’t been invited to the photoshoot but his cheap costume enthralled us and our guards came crashing down. We put on dramatic heroic faces as we stabbed our new gladiator friend with his wooden sword, our thoughts preoccupied with how cool the Instagram shot would look. 2 minutes later, he stuck out his hand demanding €10 (about USD11). We reluctantly paid his bill, splitting it between the two of us. Instagram banished from my thoughts, my thoughts wandered to all the things that could have afforded me- another night in Rome, dinner for tonight, a bus pass… You’ll be glad to hear that when a slick-backed Italian approached us in Venice offering a bouquet of red roses, we vehemently refused. What you should spend your money on- having your portrait painted. You already know how I feel about the train ride from Rome to Venice so I’ll avoid talking about the journey. I’ll just tell you about the train station. Feeling drained and exhausted from the extended train journey, we decided to grab a snack in the train station. Ruva trotted off to a coffee shop to find a drink whilst I installed myself in a sandwich shop with my first meal in 12 hours. I don’t know about you but I enjoy people-watching. I couldn’t help but notice a shabby middle aged woman jumping from person to person outside the shop. Honestly speaking, I was too tired to give her a second thought and was quick to dismiss her when she came to my table asking for money. If you think that I gave her a cold reception, it was nothing compared to the people sitting at the table next to me. ‘THIEF!’ they exclaimed, ‘She just tried to rob us outside the shop, get out!’ screamed the distraught Americans. My curiosity aroused, I decided to actively spectate the debacle. Rapid Italian insults (I imagine they were insults, the old lady didn’t use a very polite tone) followed and the beggar was quickly dismissed from the shop. Ruva arrived with her hot chocolate soon after, having missed the entire thing. I was quick to alert her to the actions of the pickpocket outside though. There is no way that that man lacked coordination to the extent that he had to lean heavily on everyone who walked past him. Before I forget to mention it, we stayed at Camping Rialto. Yep, that’s a camping site. I’ll say it one more time for the people at the back, we slept at a camping site, in a tent. A nicely furnished tent for that matter, it housed 2 single beds with clean linens, a thick blanket and smooth wooden flooring. It was my first time sleeping in a tent, and I wish that someone told me how hot tents get. It’s like a greenhouse, the air feels like it’s suffocating you. It’s pretty glamorous for a campsite, I only begrudge the fact that there were 8 charging stations for the entire campsite which houses about 200 people. You can imagine how nightmarish that would be for millennials. All in all, I did enjoy our stay here (and the price) and I would recommend it to all my fellow backpackers. Fun fact: the touristic Venice only encompasses the island of Venice. Mainland Venice, known as Venezia Mestre is generally unattractive and there’s not much to see. I would like to tell you that every street corner on the island of Venice was painted in beautiful pastel, lined with marvellous cobblestones and adorned by beautiful colourful magnolias. That may be true for the streets of Venice that are most frequently walked by tourists, but it doesn’t reflect the quieter side of town, where the less affluent Venezians reside. For what it’s worth, Venice is incredibly stunning. However there isn’t much to it besides walking around, getting lost and discovering yet another canal. With the price of a gondola ride starting at €80 (about USD90), that’s the only thing we could afford to do. Thankfully, the price of food was more reasonable. I enjoyed several cups of authenitc Italian gelato, almond cream filled cannolis and even a glass of Prosecco. This city has a multitude of picturesque scenes but to avoid boredom, I would advise you not to spend more than 24 hours here. We had initially planned to take the boat out to Lido Beach and spend our second day there, but we hadn’t factored the transport strike into the equation. Private boats had the monopoly on the canals and we weren’t keen on spending €40 (about USD45) on a trip that was supposed to only cost half as much. Alternatively, we visited the Magnum store and had custom Magnums made for us for the grand total of €5! The rest of the trip was characterised by getting lost, discovering even more basilicas and chasing pigeons. That sums up our tour of Italy! If you have any questions then feel free to ask me in the comments. Did you have a different experience in Italy? Let me know! As always, sending love to wherever you are in the world! Hey all! I thought it would be a fun idea or me to write more about what I do when I’m not slaving away over a hot stove. Welcome to the category titled, ‘Outside the Kitchen’! I’d like to think that I’m a diverse person with several different interests that include sustainable living, sport and literature. You may be familiar with my ‘Actuellement’ posts that give a brief snapshot of where I am at the current point in time. This series of posts will differ in that they will include much less writing-this is all about the photos. Shall we dive in? Forgive me- I am fully aware that I had stated that I would be writing about what I do when I’m not in the kitchen. Unfortunately, Saturday morning was spent in the kitchen. 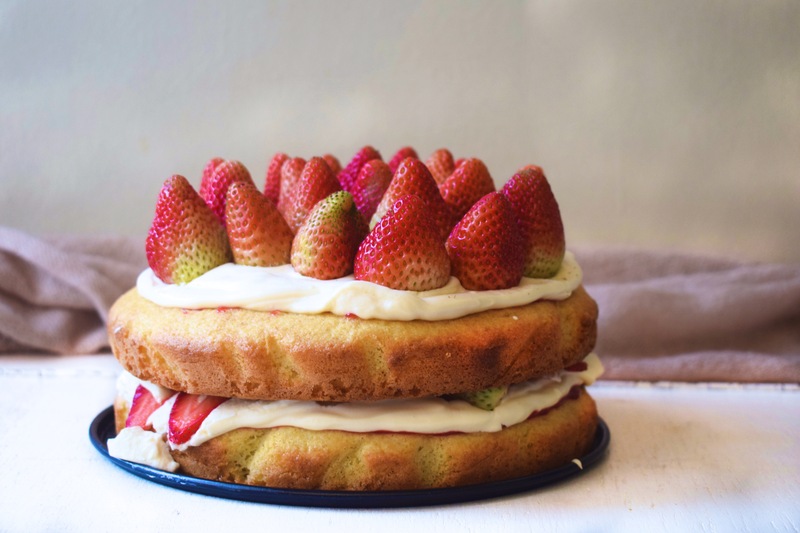 Allow me to redeem myself- it’s the day of the Women’s Wimbledon Finals, there was no way that I wasn’t going to be hosting a party. What was on the menu? 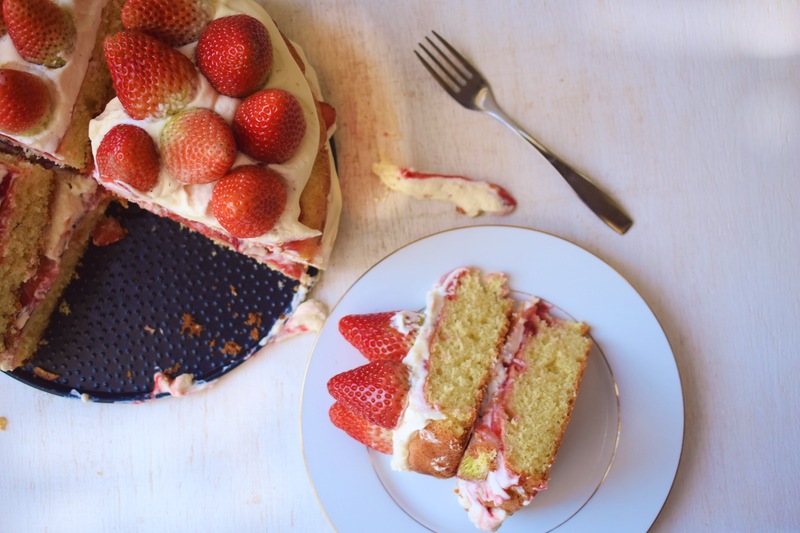 Strawberries + cream, a Wimbledon classic, sandwiched between Victorian sponge cake. 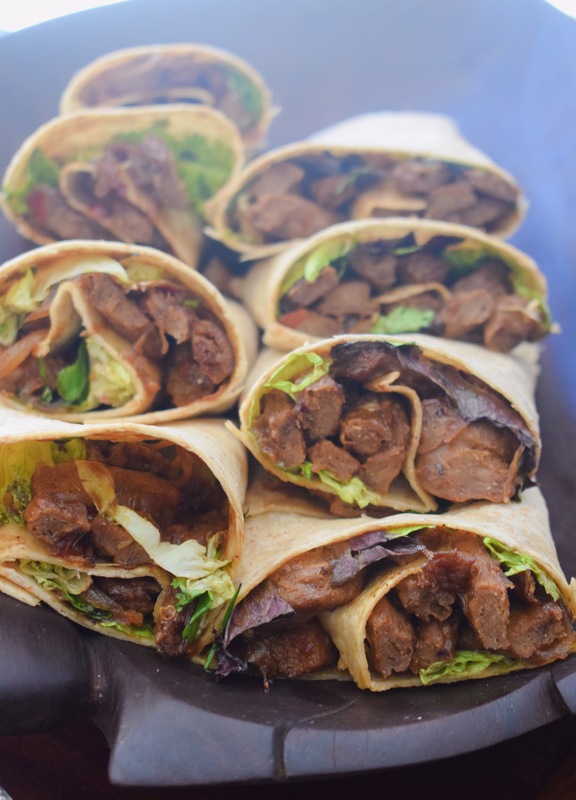 Vegan soy chunks tossed in a creamy mushroom sauce, wrapped in a wholewheat tortilla on a bed of rocket. Sparkling non-alcoholic grape juice for the toasts. Big news: we have a new pet! Well, not really a pet as we still haven’t decided if we’re keeping it. 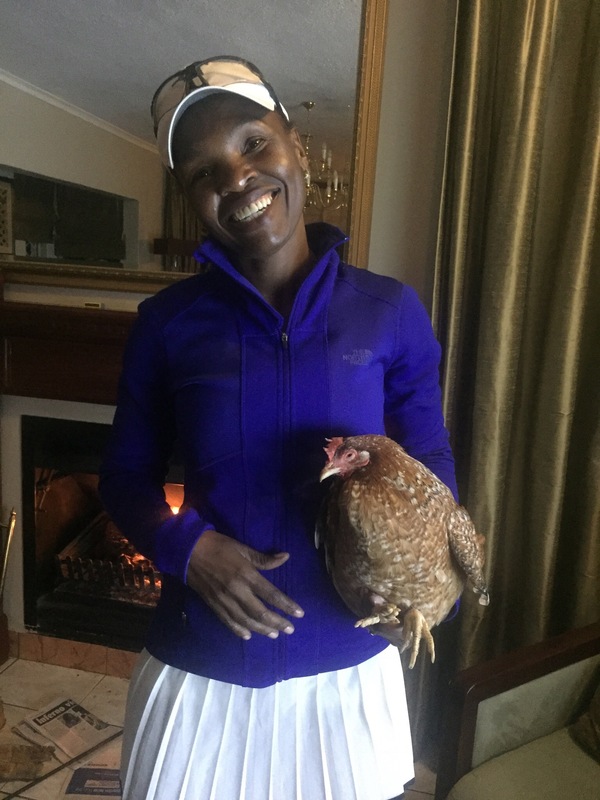 My mum’s friend gifted us with a chicken as a late birthday present- welcome to Africa. 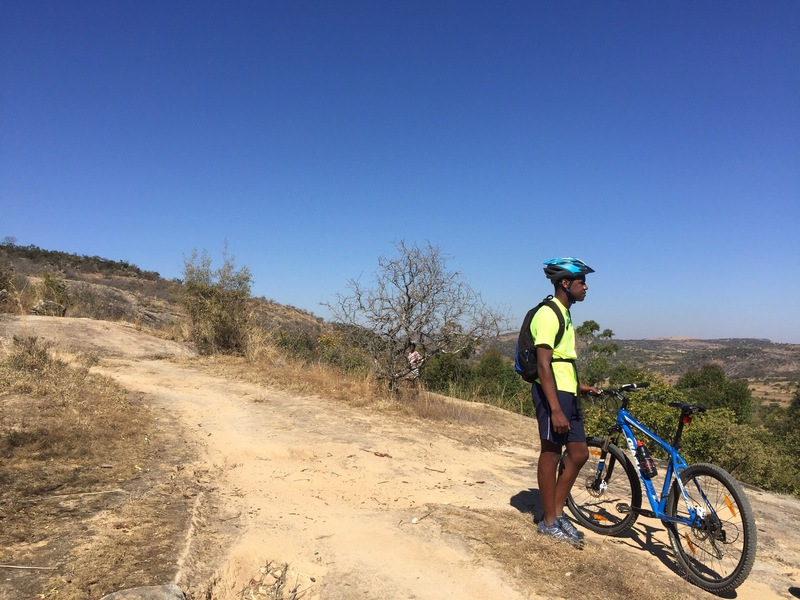 We had the quite the early start with an 8am bike ride at Domboshawa. 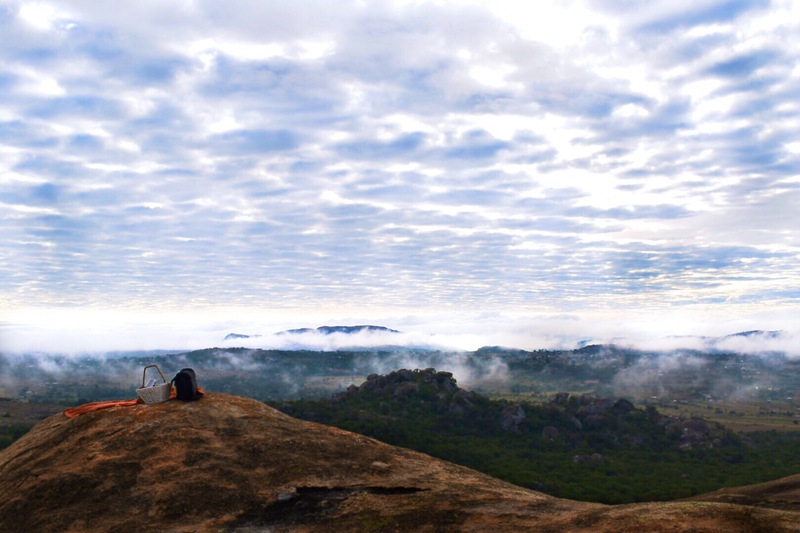 Domboshawa is about 40 km outside the city of Harare, the landscape is mostly made up of granite mountains and open velds. 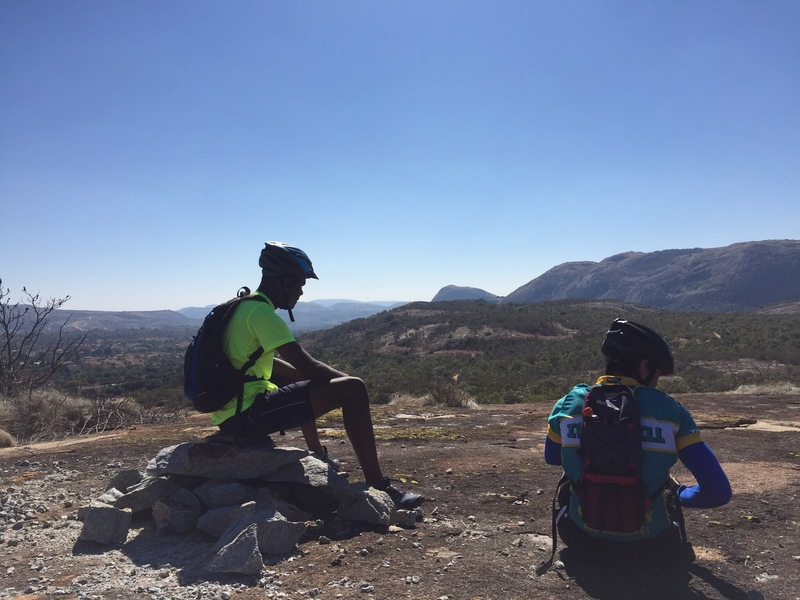 We had originally planned to cycle 24.5 km but after a couple of wrong turns, we eventually end up doing 27.5 km. History was made on Sunday afternoon when Roger Federer won his 8th Wimbledon title and NINETEENTH grand slam title. Incredible! This man has endured through the ages and is still crushing his opposition at 35 years of age. One would think that my weekend would have ended here but what kind of Game of Thrones fan would I be if I didn’t stay up to watch he Season 7 premiere? The show started at 9pm EST which translated to 3 am in Zimbabwe. Call me crazy but it was totally worth it. BONUS: I published the recipe for these Chickpea Vegan Burgers, if you haven’t seen it yet then get over there right now! There was no way in hell that I was going to spend a month away from home and you guys would not hear a single word about it. In fact, 3 weeks from now you’ll most likely be begging me to stop talking about it. This trip changed me in more ways than I could possibly describe or convey to another person. It feels like a veil has been lifted from my eyes and I can see the world in more ways than I could have ever dreamed. Although this was not my first time travelling outside my home country of Zimbabwe, this was the first time I got to do it alone. With my parents sitting comfortably (or should I say anxiously) at home more than 10,000 km away, I was left without the usual cosy nest we call ‘parental guidance’. It was up to me to evaluate the options and make careful decisions. It was up to me to make sure that I booked the right train and arrived at the station on time and descended the train at the right station AND remembered all my belongings. Spoiler alert: I failed dismally at these 4 things. It was a glimpse of what my future college life is going to be. Some parts of it look glorious: walking along the pier at sunset, chattering away with new friends in the park and discovering new parks and restaurants to visit. Other parts of it are unglamorous: scrubbing away at messes you’ve made, miscalculating your transport time and having to sprint for a train (I have calculated that you only make the train 4,87% of the time #alternativemaths), and the absolute killer: the persistent feeling that you have no idea what you’re doing. Much to my relief, I discovered that this a sentiment shared by several adults, the aim of the game is to be confident in yourself and believe that what you’re doing is right. I could write for hours on end about my experiences, my mishaps and the lessons I’ve learned but I’ll be breaking those down in a series of posts on the subject of this particular trip. Today, I’d just like to give you a quick synopsis of the places I visited, the things I saw and the activities I did there. Are we ready? Let’s dive in. This metropolitan city remains my favourite in Switzerland. There is no shortage of things to do here. Most of my time was spent here, as I was staying with my aunt when in the city, and in hostels when in other cities. This was my third time visiting Geneva and it never fails to disappoint. Lac Léman is stunning from all angles, but it is truly breathtaking when the Jet d’Eau is spurting water to a height of 140 metres (460 feet!). Geneva is beautifully modern but also dedicated to sustainability. You’ll find several recycling bins, electric cars and bike stations around town. Geneva is also the headquarters of the United Nations. The Swiss people are generally placid i.e. cool, calm and collected. They abstained from both world wars which is why they are notorious for being peaceful. Montreux is a resort town, known for it’s iconic Jazz festival in July (happening this week and I’m back at home! ), the gorgeous views it provides of the Alps and Lac Léman, and the iconic Chateaux Chillon, the pinnacle of Swiss middle aged architecture. Let’s take a break from Switzerland to talk about Italy for a second. Although the journey to the Swiss-Italian border is less than 2 hours from Geneva by car, the difference in the 2 countries is stark. I found Italy to be more fast paced, much noisier and more crowded than Switzerland. It all comes down to the culture and the people that live there, and one has to be able to appreciate diversity in order to truly enjoy the uniqueness and beauty of different cultures. It was at this point that I was joined by my travel buddy Ruva; we were at school together for a year before she left to spend a year on exchange in the dairy state, Wisconsin, USA. We only had a day in Rome so we visited all the typical tourist sites, the Colosseum, Gianicolo Hill & Torre Argentina. Torre Argentina is he place where Caesar is believed to have been stabbed 23 times by his closest friends, and is now home to a horde of stray cats- because birds of a feather stick together. Upon arrival in Venice, we were greatly surprised to discover that there was not a single canal in sight. ‘But what about all the photos we’ve seen? Are we in the wrong place?’, we lamented. It was only later that evening during a frantic Google search at our hostel that we discovered that the canals are on the island of Venice, whilst we were staying on mainland Venice- known as Venezia-Mestre. Fortunately, the island was only 20 minutes away by bus, hip hip hooray! Venice is all about getting lost, and get lost we did. Turning down side streets, dead-ends and walking into large open squares, I logged about 13km in my step counter that day. The island of Venice is wonderfully iconic with it’s flowing canals and traditional gondolas, but this is not a city for those of us on a budget. Trust that I will be writing a more in-depth review about Rome & Venice in particular, I think it’s important to present both the good and the bad to potential tourists. After a week in Italy (and over 50km covered by foot) we were knackered upon our return to Geneva. It was to be 3 more days before we hungrily set off for Annecy in France. This city is picture-perfect, just like a postcard. With breathtaking views of Lac Léman and the French alps, this town is resort-like in its charm. We only spent a couple of hours here, but it’s bookmarked for my next trip to Europe, this town is like a magnet and something about is pulling me back. La retour à la Suisse! This is where Ruva and I parted ways, her to Slovakia and me to Interlaken. That was incredibly disastrous for me as I fell asleep on the train, missed a connection and found myself in Zurich- more than 100km away! Although I am not one to shy away from adventure, the CHF66 (about USD68) dent that it left in my pocket was enough to frighten me away from exploring this particular city. When I finally arrived in Interlaken, 3 hours after I was originally expected to arrive, I instantly fell in love with this city. The gentle looming mountains, the crystal blue waters of the lakes Brienz & Thun and the tranquil atmosphere of the city were all persuading me to stay. If it wasn’t for the fact that I was meeting my mother in Basel in 2 days time, I would still be there right now. Interlaken is a city of adventure but with my budget cut short by the stern (yet friendly and helpful) train conductrice, I could only afford to ascend Schynige Platte and spend the day hiking the various trails there. This sleepy little town didn’t give me much to see, but it was here that I was reunited with my mother after having been away for 3 weeks. We spent the afternoon bonding doing some much needed retail therapy before settling down to enjoy the sunset. Fun fact: Switzerland is no man’s land on Sundays. Whether you’re in Basel, Geneva or Bern, everything shuts down on Sunday. Unfortunately for me, I was in Basel on Sunday. I don’t have much to report about this city aside from the interesting architecture and fascinating statues. Lausanne is beautiful. I know this not from my visit but from photos. ‘But Andrea, why would you write about this city if you didn’t visit it?’ you ponder. The answer: I visited Lausanne on a rainy day when my camera battery had died (I left my charger in Geneva, how clever). Even under the dreary storm clouds, I could still remark on the stunning landscapes, rolling hills littered with neat rows of grapevines leading down to the omnipresent Lac Léman. Lausanne, I will be back for you, one day. As we are approaching the 1500 word mark, this is where I shall end off for today. Fear not dear readers, I will be posting more detailed versions of my excursions to the various cities, this is merely a summary and a glimpse into what will come next. As always, I invite you to comment your own European experiences, travel stories from anywhere in the globe or opinions about these particular cities. Challenge me to a duel on the subject of the beauty of the Italian countryside (trust that I’ve been battling this out on Facebook already), lament to me about the misfortunes of travelling by train (seriously, it is not as easy as you think it is), or chatter away to me about the wonders of globe trotting! Question of the day: how does one deal with the millions of mementos that you inevitably end up with at the end of a holiday? 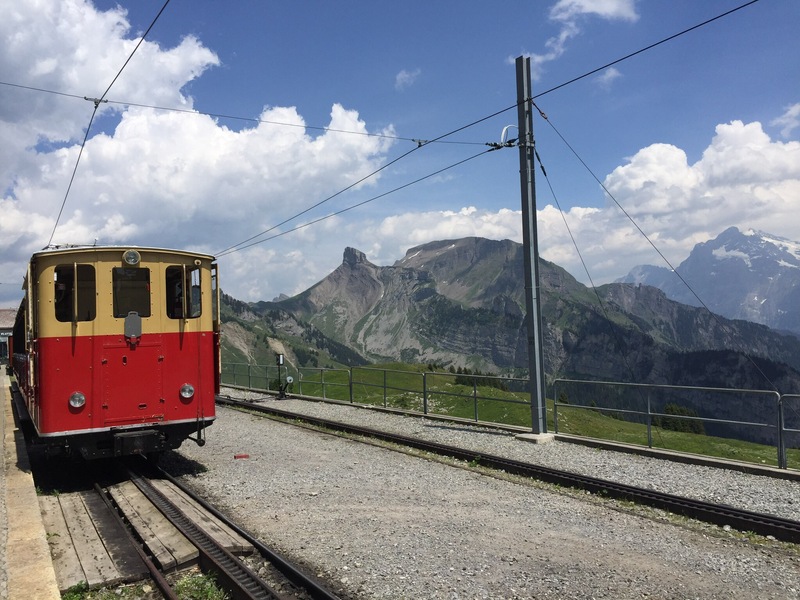 Posted on July 12, 2017 July 24, 2017 Categories Outside the Kitchen, TravelTags annecy, backpacking, basel, destinations, europe, europe trip, france, geneva, geneve, interlaken, italy, lausanne, montreux, rome, slideshow, switzerland, Travel, venice3 Comments on My Trip To Europe!